The critical well in a field development needs to have a fracture design. What data is important to generate a good design? How would you go about generating the design? This Frac Tips is general overview of the required information, where it is obtained, and how it is utilized to generate treatment designs. Reservoir porosity can be obtained from log measurements or core testing. Formation temperature is measured from logs. The production fluids (oil, gas, water) and their saturations can be calculated from logs and from core data. The reservoir geology can also have a major effect on fracture design, primarily through drainage area. Treatment execution can be impacted by geologic features such as faults, unconformities, and fractures. Ignoring this information can have disastrous results. A visit with your friendly local geologist is always a good idea when designing a treatment in a new area! The reservoir wetting phase (oil or water wet) can be determined from core information or inferred from production in the same reservoir. Oil gravity, gas gravity and percentage of impurities ( CO2, N2, and H2S ) can be determined from laboratory measurement of fluid samples. 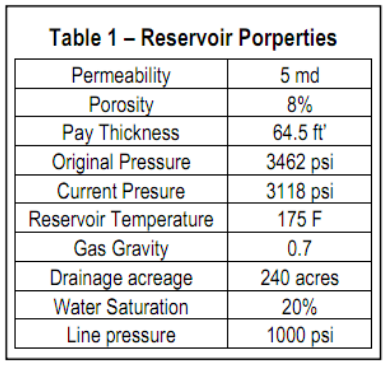 The production yield (gas perbarrel or barrel per mcf) can be measured or estimated from other known reservoirs in the area. tential for “soft” formations. Core can also be used to determine formation embedment and toughness (or apparent toughness). Apparent toughness controls the tip pressure required for fracture propagation. This is a complex variable that must be measured from field minifrac testing. 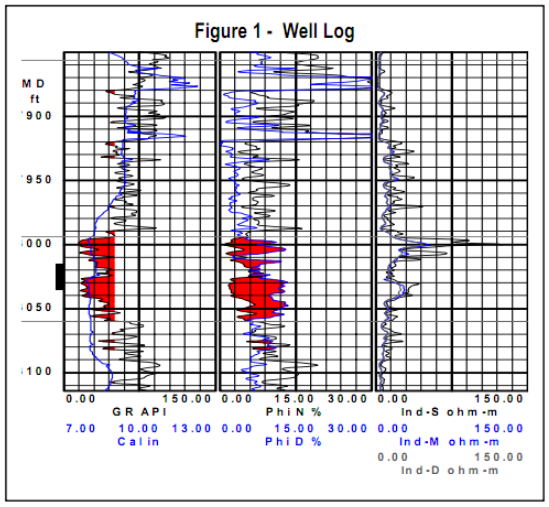 A deviation survey is required for deviated wells. Offshore, the water depth is needed to calculate zone stresses. The existing casing size and drilling bit size need to be known so perforating charges can be chosen with the proper holesize/ penetration for the planned proppant size and concentrations. 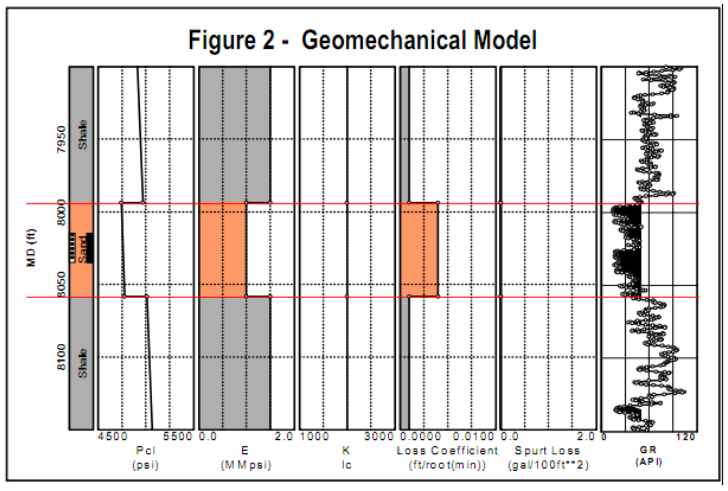 The perforating scheme for the well also depends on the wellbore deviation and fracture geometry. More information on perforating long intervals can be found in the Frac Tips “Perforating Long Intervals”. The work string needs to be sized for the planned stimulation treatment pump rates, and must be considered prior to choosing a fracturing fluid. The production string needs to be sized for the expected production rates as determined by a reservoir simulator, nodal, or company policy. The production line pressure or the suction pressure for the compressor and the associated temperature is required for an estimation of the production rates the reservoir will produce. Any other facilities data that could hinder potential production such as pipeline or separator size needs to be known. A stress profile can be generated from historical data or by knowing the pressure profile for the zones and using the relationship in Equation 1, where σCL is the in situ stress or the fracture closure stress, OB is the weight of the overburden typically between about 0.85 and 1.1psi/foot-of-depth,ѵ is Poisson’s Ratio typically between 0.2 & 0.3, PRes is reservoir pressure, and T is any tectonic in-situ stress effects. A dynamic value for ѵ can be determined from dipole sonic logs, and thus a stress log generated. Unfortunately, the log does not measure in-situ stress due to “T”, thus, log data MUST be calibrated with field measured in situ stresses. fluid loss in a particular formation (with a particular fluid) must come from field minifrac testing. There are many choices of fracturing fluids and proppants. A fracturing fluid should be chosen based on reservoir permeability as well as temperature and wettability of the formation. The fluid chosen should yield an efficiency of at least 10%. If less then a system with better fluid loss control should be selected. The fluid should be tested with a viscometer using the chemicals from the field area and the local source water being used. Breaker schedules should be developed and tested in the laboratory, and confirmed in the field. The proppant is selected based on the effective proppant stress, availability in the field, and price. A major consideration for proppant selection will be formation permeability and the “need” for fracture conductivity. This dependence on desired fracture conductivity, kFw, and formation permeability can be seen from dimensionless conductivity, FCD, where a desirable FCD is always at least 2 (> 2 may be desirable for lower permeability zones where transient flow is important). Proppant stress can be calculated with Equation 2 where ∆ is incremental stress due to the propped fracture width. ∆ is usually small (200 to 400 psi) but can be significant in some cases such as TSO (tip screenout) treatments in a moderate permeability, “hard” rock. Pwf is bottomhole flowing pressure. the previous frac yielding a leak-off coefficient of 0.003 ft/√min, thus yielding an efficiency of 20% after a 7,000 gallon minifrac. The proppant chosen for the job was an economical ceramic proppant. The price of the local sand and ceramic proppant were about the same, but the ceramic proppant yielded much higher conductivity numbers at the given stresses, and thus less proppant for the equivalent conductivity. This information was placed into StimPlan and a geomechanical model generated (see Figure 2). The available information was placed into an analytical production model and determined the optimum fracture length was approximately 150’, with 1,500 md-ft of conductivity. This equates to an FCD = 2, or an optimal fracture length design. A proppant pump schedule can be designed to achieve these results. To generate an optimal fracture design requires data. Possibly the most important is an accurate permeability. Most of the information is readily available from sources within the company or can be obtained at reasonable expense. Previous fracture treatments in the same zone can yield valuable information for future treatments. Collecting, storing, and using this data can provide the greatest opportunity to successfully design and execute a fracture treatment in your reservoir.